Cartoon by the Rev. 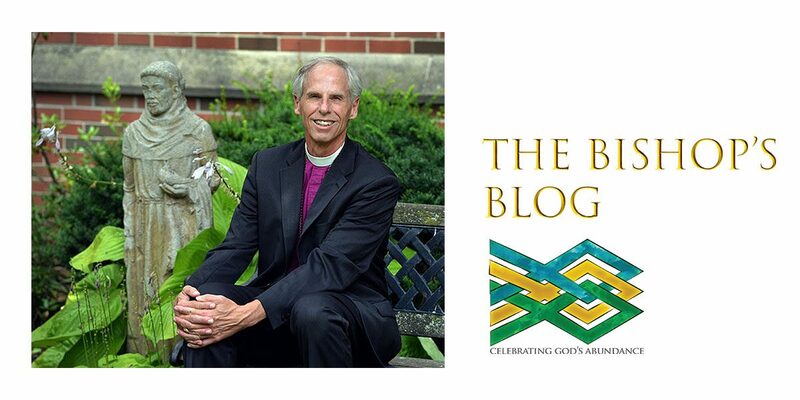 Jay Sidebotham for Church Publishing Inc. I have often begun Christmas sermons, and reflections about Christmas, with stories about Christmas Pageants I have seen. Like the time the child portraying the angel Gabriel did not exit the stage after her “annunciation” to Mary. Instead she stayed with Mary through all the rejections she and Joseph and the baby Jesus faced as they were turned away at inn after inn. And Gabriel looked on aghast but never left them. Or the time the youngest children dressed as sheep were crawling down the middle aisle of the Church toward the stable as “Holy Night” was being sung. But when one noticed all the toys off to the side that had been collected for the needy, he broke ranks and headed for the toys. And so did the rest of the flock. The director and the young actress settled on a compromise. 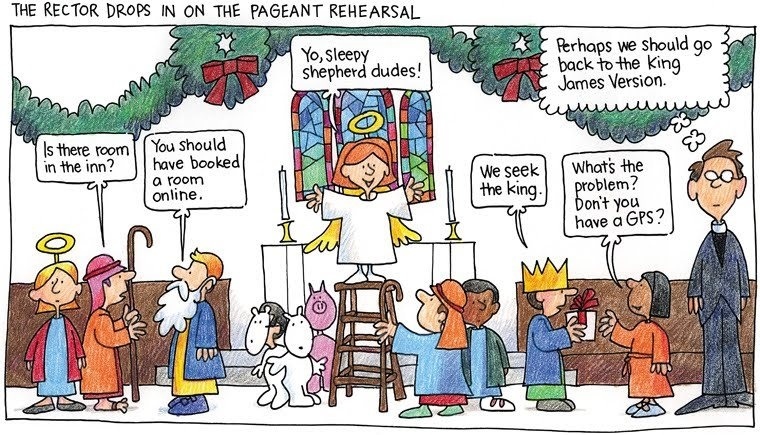 An actor dressed as the king would stand at the far edge of the stage throughout the pageant, hovering over the story of the first Christmas. This part of the story makes us feel uncomfortable but it is true. Baby Jesus was not born into a spiritualized abstraction. He was born in the midst of a poor people ruled by a tyrant who was propped up by an Empire. He was born to parents who immediately became refugees fleeing to protect him. Christmas is about hope, about dreaming of a better world while we are in the midst of this one. Christmas reminds us of all the love that is around us, reminds us of so much that is good and holy and sacred. At Christmas we tell stories of our “better angels.” Christmas reminds us of generosity and forgiveness and courage – even as King Herod looks on. Christmas reminds us that God has not given up on us. Just the opposite. We call this baby, “Jesus” – which means “God saves us.” And the angels tell us “do not be afraid. This is a message of great joy.” God is here now, in 2018, in the midst of us. Christmas Eve is all about the music. Not just the music the choir will lead us in – as outstanding as that choir is here at our Cathedral – but the “feel” of this night, the light in the darkness, the deep down sense in our soul that in a troubled world God is here with us, no matter what. 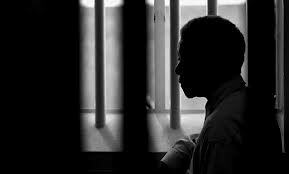 Mandela was kept in prison for another fourteen years. During that time he constantly thought of Hope. Hope was not just an idea. For him it was a person. Hope was alive. So long as Hope was alive, Mandela could keep on going. He never gave up and ultimately created a whole new social and political system in South Africa. Let’s look at the name of the child born this night. 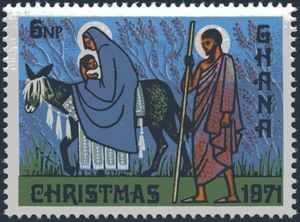 In Matthew’s gospel we are told an angel appeared to Joseph in a dream and gave him two names for the baby – Jesus and Emmanuel. Emmanuel means “God with us.” In Luke’s Gospel, Mary is told by the angel Gabriel to name him Jesus. No Emmanuel. I’m imagining Joseph and Mary having the baby name discussion parents have and ultimately they chose “Jesus” because that had two angels’ votes and only one for Emmanuel. See, our salvation is not just an idea. Salvation is a person. Salvation is alive in this world. Don’t we need to know that now, perhaps more than ever before? I find it fascinating that at Christmas in 2012 in Newtown, Connecticut, right after the horrific tragedy of the shootings at Sandy Hook Elementary School, all the churches still held their Christmas Pageants. Even though some of the children who would have performed in those Pageants had been killed. They needed the Christmas story. They needed to believe that the baby named Save is still among us. No, the angel is clear. Jesus is born to you poor shepherds. The one who offers mercy and compassion and hope is born to you. Although I did not notice that until this year, thank God the people who have changed the world for the better noticed it. One example, Rosa Parks. You know the story. 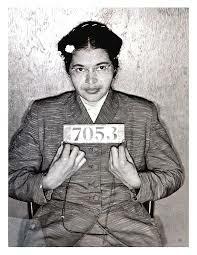 On December first, 1955 Rosa was coming home from work in Montgomery Alabama on a public bus. In that time and place they had a law that buses have a section for people of color and a section for whites. If the white section was filled, people of color were expected to give their seat away to the white person. On this bus the white section was full and a white man was standing. The bus driver told Rosa to give up her seat. She refused. She was arrested, and the black community of Montgomery, led by a 27-year-old preacher named Martin Luther King Jr., staged a boycott of the bus system. The civil rights movement began in earnest. That’s the part of the story we know, but there is a little known and crucial backstory. In the months before December first, Rosa Parks was part of a bible study at her church. As they studied the bible they recognized the dignity of all God’s children. 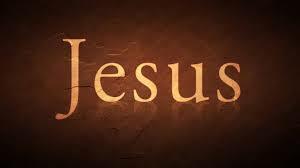 And they understood the non-violent actions for change taken by Jesus of Nazareth. They started talking about a boycott of the bus system. Could it be that Rosa’s bible study group read the angel’s words “to you is born this day a Savior”? And she heard the music of those words and took them into her soul? What would happen to the lives of you and me, of our troubled society, if we took those words into our souls? Our faith is not an abstraction. There is a person named “Save” and he is alive among us. Ok, we are getting closer to the candles and singing “Silent Night.” Just one more underappreciated bible fact and one more image. The angels tell the shepherds to look for a “child wrapped in bands of cloth.” We will hear about cloth again in Luke’s gospel… when Jesus dies. The mission has been a failure. Mercy, compassion and hope have come into this world and the powers of this world killed it. But when the women go to anoint the body of the dead Jesus, he is not there. What is in the tomb? “Peter ran to the tomb; stooping and looking in, he saw the linen cloths by themselves; then he went home, amazed at what had happened.” God never gives up. In God there is abundant life that never dies. And that is not all. Luke tells us after several meetings with the Risen Jesus, as Jesus leaves he says “you will be clothed with power from on high.” The God who is with and in Jesus is here and with us and in us. Let’s end by going back to the baby. Have you ever noticed what a baby does when you put your finger in his hand? He holds on very tight and won’t let go. Tonight we see a baby named “Save” who is holding on with all his might to God with one hand. And with the other hand that baby, born to us, is holding on to you and me, to all humanity. And he won’t let go, no matter what. God is with us. God is saving us. Hope is alive in the world, on this night and always. Amen.